Could air pollution in your home be making you ill? We all know to be wary of pollution outside of the home, but did you know that the air quality inside the home is even more important? We spend 90% of our time indoors so ensuring good indoor air quality is essential, especially for those with breathing issues such as asthma or lung conditions such as Chronic Obstructive Pulmonary Diseases (COPD) or pneumonia. Children whose lungs are still developing are also particularly vulnerable to air quality, as are those with compromised immune systems. Poor air quality in the home can also increase your risk of stroke and heart disease. At this time of year when the weather is cold we naturally spend more time indoors, making the quality of our indoor atmosphere even more important. Symptoms of indoor air pollution start with a dry throat, cough, runny nose and feeling wheezy. Indoor air pollution is affected by many factors. You may already be aware of some of these such as cleaning or decorating chemicals, building materials or tobacco smoke. However there are other key factors especially at this time of year, which impact on the quality of the air you breathe indoors. Read on to find out what these are and what you can do about them. 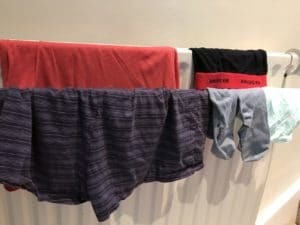 Medical experts have issued a health warning about the dangers of regularly drying your clothes indoors on a radiator. One study in Scotland revealed 30% of indoor moisture came from drying clothes indoors. The problem comes when damp air allows mould to thrive and creates conditions for a fungal condition called Aspergillosis. This can affect the respiratory system, particularly for those with a weakened immune system or an existing lung condition, Aspergillosis can be life-threatening. According to Asthma UK, 42% of people with asthma report mould and fungi as known triggers of their asthma. The best practice is to dry clothes outdoors if possible, otherwise in a well-ventilated utility room. Although expensive, a tumble dryer is the healthier option. If it is unavoidable to dry clothes indoors, then make sure a window is open to keep the area well ventilated. Less humidity results in less mould spores. You can also buy heated drying rails with a cover that turns them into an airing cupboard which offer another possible option to avoid increasing humidity. Good to know: Mould spores are at their highest in autumn and winter. If your house is damp, be aware that there will be an increase in indoor spores when the central heating is turned on. Nothing says Christmas more than the smell of spicy scented candle. However be aware that candles and incense let off particles such as *VOC’s and other pollutants such as formaldehyde when they burn. Incense sticks give off 100 times the amount of fine particles as a scented candle. One study at York University discovered a commonly used ingredient in citric-scented scented candles called limonene reacts with the air creating formaldehyde. The study revealed concentrations of limonene in scented candles were up to 100 times higher than previously thought. 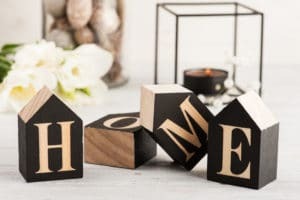 The study warned fragrance chemicals could completely dominate insides our homes meaning, increasing our exposure to formaldehyde, which is known to be harmful to health over the long term. The study concluded with the recommendation of opening doors or windows after burning a scented candle or spraying air freshener. The British Lung Foundation advises you don’t light several scented candles or incense sticks in a confined space such as a bathroom. However occasional use is okay. Good to know: Houseplants such as geraniums, lavender and types of fern would found to remove formaldehyde from the atmosphere. Nothing conveys cosy better than a blazing fire. However having an open fire or stove that burns wood or coal releases particulate matter that can give you breathing problems, or cause your existing symptoms to worsen by inflaming your airways. In urban areas, wood burning is thought to increase particulate matter to levels comparable to those from traffic pollution. Studies show our homes can be affected by smoke from a neighbour’s wood fire too. Open fires produce greater emissions that stoves. Burning wood and coal can also release carbon monoxide and lead to poisoning – ensure you have a working alarm that is regularly serviced. Get flues and chimneys cleared annually and know the signs of carbon monoxide poisoning. Good to know: Improving ventilation can cut the risk your asthma being triggered by smoke from a fire. According to Asthma UK’s annual survey, 64% report their asthma being triggered by dust mites. Thanks to central heating, dust mites can multiply in winter. These tiny mites live in the cushions and throws we may use more in winter, as well as pillows, mattresses, and bedroom carpets. Dust mites feed on dead skin and live in the dust that accumulates in our houses. Keeping your home well ventilated can reduce humidity which allows dust mites to thrive. Anecdotal evidence suggests that regular cleaning, investing in air filters and washing clothes and bedding at 60 degrees can reduce dust mites. However Asthma UK reports no consistent evidence this is the case and suggests taking regular preventer medicine is beneficial to managing asthma symptoms and ensure you have your reliever inhaler with you at all times. Good to know: One study found children using dust mite proof covers on their bedding – eg mattress, duvet and pillowcase – resulted in the children being less likely to be hospitalised due to an asthma attack. However, Asthma UK wanted more research to confirm this was the case. Keep all areas clean and dry as possible Open windows for 5-10 minutes daily. When showering, use an extractor fan to remove moisture from the air. Or open a window. Keep the door shut to limit the spread of damp air. In humid kitchens or damp bathrooms keep surfaces clean. Surfaces with soap scum or grease can be fertile breeding grounds for mould spores. In the kitchen, keep an eye out for mould in refrigerator drip pans, washing machine door seals, and dustbins. When cooking use an extractor fan or open a window. Keep lids on saucepans when cooking. Wipe down wet windowsills to remove condensation. Condensation can lead to mould and fungi to grow. Deal with any mould in the home. Check for and rectify any water leaks in bathrooms, kitchens and the hot water tank. Check your flues are working well and get your chimney swept regularly to enable smoke and pollution particles to leave the room. Keep the room temperature in the home stable. The recommended temperature is 18 degrees. High humidity can keep the air moist provides perfect conditions for mould to thrive. If you have a long-term lung issue, consider investing in an indoor air quality sensor. This will tell you the air temperature, relative humidity, the levels of *VOC’s, dust particles and carbon monoxide. *Volatile organic compounds (VOCs) are compounds that easily become vapours or gases. VOCs are released from burning fuel such as gasoline, wood, coal, or natural gas as well as from many consumer products such as cigarettes, scented candles and solvents.